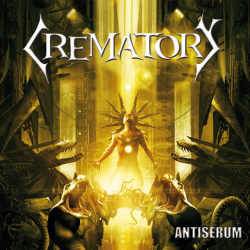 Crematory are without a double one of the pioneers of the German gothic metal scene. Even though they went on a hiatus early in the millennium, they have been quite active again since 2004. Their twelfth album Antiserum shows the band more a considerably more electronic side than before. This should be understood as a nod to their comeback album Revolution where they took first steps into a more industrial direction. The strong EBM influence is probably also due to the collaboration with Elmar Schmidt from Centhron. Antiserum offers mostly brutal metal with electronic touches. The verses are kept rather raw with death metal growls, whereas the choruses are more melodic due to the still present gothic influences. A first highlight comes with Shadowmaker, which is also the first single off the album which has all it takes to become a regular club hit. The following If You Believe is another winner. Most of the songs are in English, but Crematory chose to have German lyrics on three songs, where especially Kommt näher should be mentioned with its dark undertones. The catchy and very techno-like Virus is also a track you won’t forget so easily. A different side of the band can be heard on Back From The Dead which harkens back to Crematory’s early years and Irony Of Fate, a classic gothic song. Lack of variety is certainly the last thing Crematory will ever be accused of. The band states to have worked for a rather long time on this album, and it shows. Antiserum is an elaborate which is unafraid to experiment with different musical orientations. It is therefore nice to hear that even after a quarter century this metal band doesn’t show any signs of weariness and is still motivated to play on.